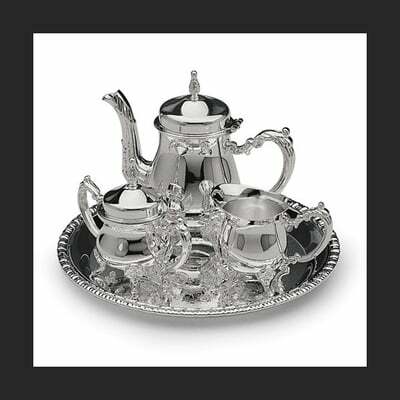 Silver Plated 4 piece mini coffee set. This coffee set measures 10 inches tall and 10 inches wide. A mini but adorable coffee set. 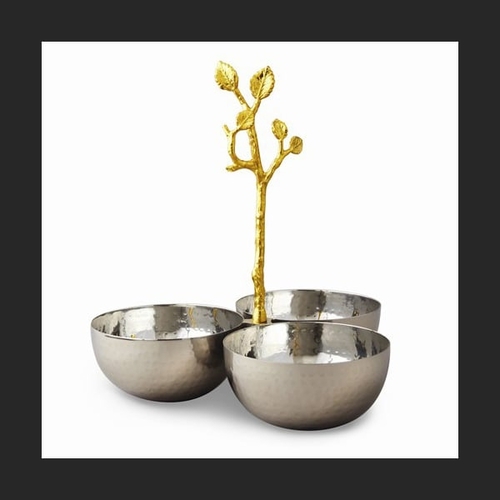 Stainless Steel golden vine hammered triple bowl. A beautiful hostess piece, 3 bowls connected to a golden vine. Child's Ladybug musical jewelry box. 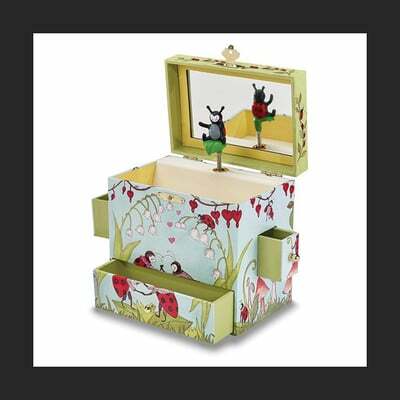 This delightful musical jewelry box is lined with velveteen and decorated with ladybugs and bleeding hearts, will be a little girl's delight. Child's Spirit and Lucky musical jewelry box. This delightful musical jewelry box is lined with velveteen and decorated with ponies, most little girl's favorite. Pretty Chickadees set of Four Coasters with holder. Coasters are stone with bright multi color chickadees. A great hostess gift. Beautiful Golden Vine Hammered square tray. 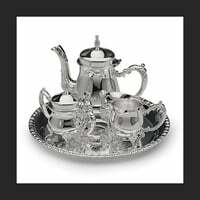 A great hostess piece, this stainless steel hammered finish tray measures 11.5 inches long by 8 inches wide. Perfect serving tray for your next holiday or dinner party. Dale Tiffany® Favrile Big Wave Vase. Incredible Crystal Vase creates a luxurious accent in your home. This artistic Crystal vase measures 8 inches long by 8 inches wide and 14.5 inches tall. Gorgeous color, you'll love this amazing Vase. Pretty Hummingbirds with orange flowers, set of Four Coasters with holder. Coasters are stone with bright multi color hummingbirds. A great hostess gift. Beautiful Golden Vine Hammered rectangular tray. A great hostess piece, this hammered finish tray measures 16 inches long by 11 inches wide. Perfect serving tray for your next holiday or dinner party. Dale Tiffany® Favrile Newport bowl. Beautiful Crystal bowl creates a luxurious accent in your home. This artistic Crystal bowl measures 15.25 inches long by 13 inches wide and 6.5 inches tall. Beautiful Mahogany finish oval cut-out jewelry box. This unique wooden jewelry box is 9.5 inches long and 10 inches tall. Sides open for necklaces to hang and 3 drawers. Very pretty box. Dale Tiffany® Ripley table lamp. This lovely accent lamp measures 18 inches wide by 27.5 inches tall. This lamp is licensed by Dale Tiffany®. Such a beautiful accent for your home. The Dale Tiffany lamps are more than light, they are truly art. Dale Tiffany® Malta table lamp. This lamp is licensed by Dale Tiffany®. This beautiful accent lamp measures 13.75 inches wide by 21.75 inches tall. Such a lovely accent for your home. Lovely Badash Crystal Rainbow Note centerpiece. This beautiful Crystal centerpiece is 16 inches tall and a wonderful accent in any home. Dale Tiffany® Floral Dragonfly table lamp. This lamp is licensed by Dale Tiffany®. This beautiful accent lamp measures 16 inches wide by 24.5 inches tall. Such a lovely accent in any home. Dale Tiffany® Egyptian Desk Lamp. Lamp measures 10 inches in length by 7.75 inches wide and 14 inches tall. This lamp is licensed by Dale Tiffany®. Pretty Cherry finish musical jewelry box. Jewelry box has 3 drawers, it's lined, multiple compartments and plays Beautiful Dreamer. Swing out compartments have necklace hooks and box also has ring rolls. A nice gift idea. Digital Cigar Humidor features a carbon fiber veneer and high gloss finish. Humidor will hold 10 cigars. 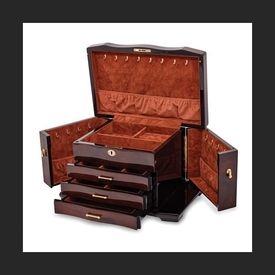 This humidor measures 10.25 inches in length by 9.25 inches wide. It is 2 inches in height. Beautiful Walnut with Burl Inlay design jewelry box. This jewelry box features swing-out sides and 3 drawers. Measures 14.75 inches in length and 9.5 inches wide by 9.5 inches tall. High gloss finish, a beautiful suede (faux) liner, and lock with key complete this box. Perfect gift for that Cat lover on your list. This Cat tail metal table clock measures 11.5 inches in length by 2.5 inches tall. A cute accent.